/ Modified jun 14, 2018 5:15 p.m.
From left, State Rep. Sally Ann Gonzales, Tucson Councilman Richard Fimbres, TUSD Boardmember Adelita Grijalva, Tucson Councilwoman Regina Romero, Pascua Yaqui Tribal Council Vice Chair Peter Yucupicio, Pima County Supervisor Richard Elias, Pima County Supervisor Sharon Bronson, Tucson Councilman Paul Durham and Tucson Mayor Johnathan Rothschild. 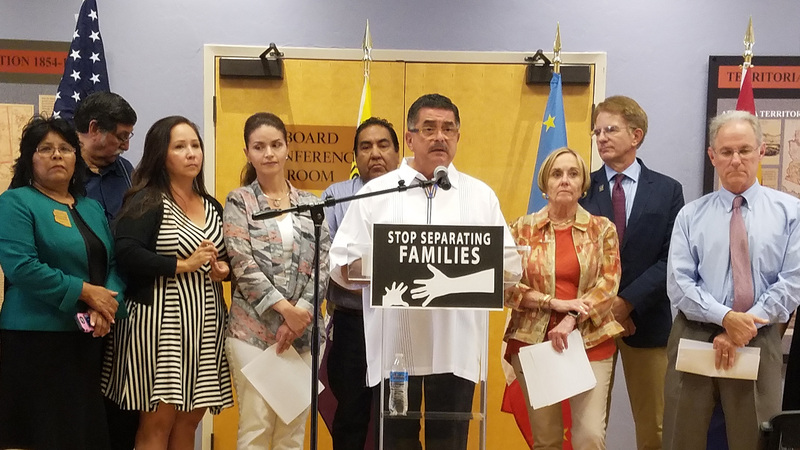 Elected officials from six different government bodies in Southern Arizona gathered Thursday to condemn a federal policy that has resulted in an increase in the number of children separated from their parents after crossing into the U.S. illegally from Mexico. The Trump administration's decision to enforce a zero-tolerance policy on prosecuting those who cross into the country illegally — including those who are seeking asylum. — has resulted in a spike of children separated from their parents after crossing into the U.S.
"You only hear that in foreign countries where they do things like this," said Pascua Yaqui Tribal Council Vice Chair Peter Yucupicio. "And all of the sudden it's happening in this time, in this term. We have to do something about it." The group included office holders or representatives from the U.S. Congress, Arizona House of Representatives, Pima County Board of Supervisors, Tucson City Council, Pascua Yaqui Tribal Council and Tucson Unified School District Governing Board. "We are not the greatest nation [anymore]," said Pima County Supervisor Sharon Bronson. "Not when we do this to children. This is not humane. It is not what humanity is all about. It is not what America was all about." Officials from Pima County and the city of Tucson say they will vote on an ordinance condemning the policy at meetings next week. MORE: Arizona, Border, Pima County, Government, Immigration, Legislature, News, Politics, Tucson, U.S.